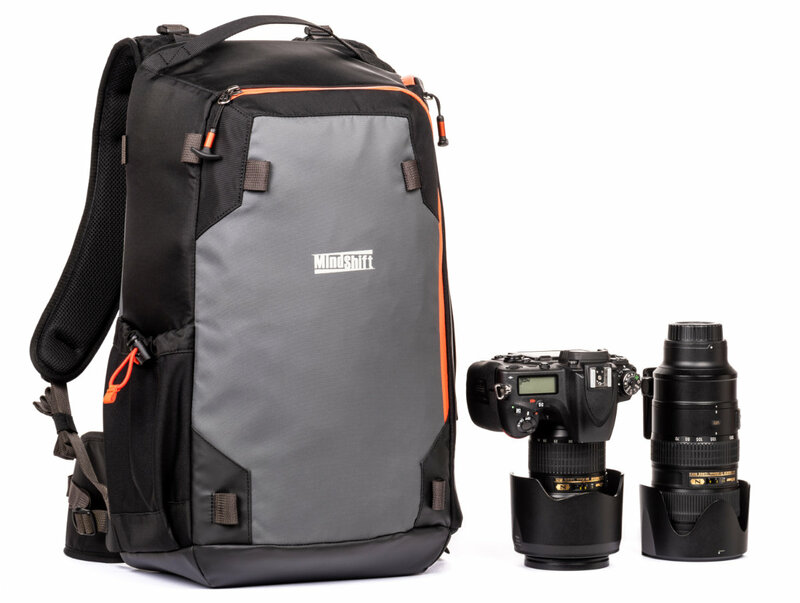 ThinkTank has announced the MindShift PhotoCross 15, a new rugged 20-litre backpack designed for toting photography gear around outdoors. The bag features an extra-large side panel alongside tripod straps, wide shoulder straps, a breathable 320G air-mesh back panel, customizable interior dividers and a seam-sealed rain cover. The PhotoCross 15 is made with a variety of durable, weather-resistant external materials, including 420D high-density nylon and heavy-duty nylon Tarpaulin. The backpack's interior features removable closed-cell foam dividers, as well as a polyurethane-backed velex liner, P210D liner and a polyurethane-coated 210T seal-sealed taffeta rain cover. 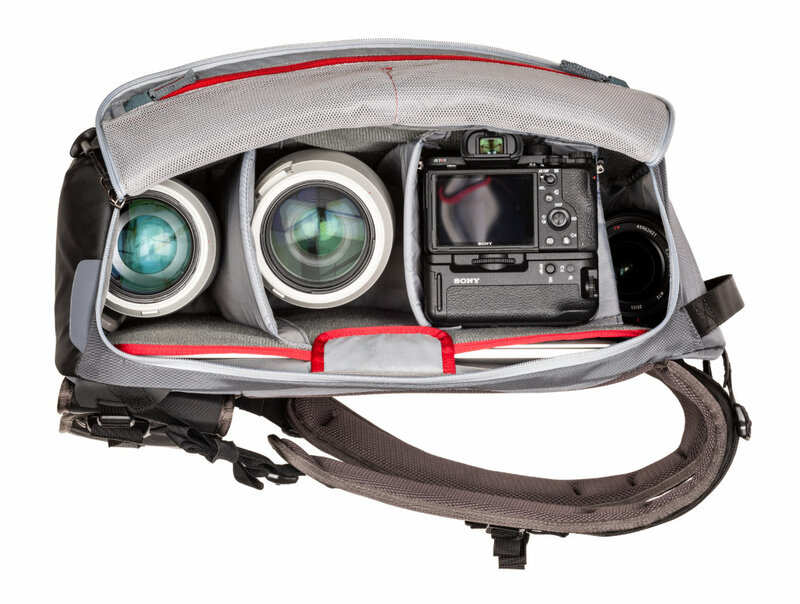 ThinkTank's new bag can accommodate an ungripped DSLR with three to five lenses (including a 70-200mm F2.8 lens) and up to a 15-inch laptop. Zippered interior pockets can be used to store memory cards, spare batteries and other small accessories. Other features include a 1L water bottle pocket, front pockets and both top and side carrying handles. The ThinkTank PhotoCross Backpack 15 retails for $169.99 USD in Carbon Grey and Orange Ember color options. This model joins the smaller PhotoCross 10 and 13 backpacks. Holy moly, these comments. If you don't like the bag, fine. But no one wants to/needs to hear your justification for not liking it. not verbatim: "I'll use a hiking backpack"
Ok, enjoy. And carry on. This actually what I do. I keep my backup compact cam at the ready in my right waist belt pocket and if I'm on a hike that has beautiful landscapes every 500ft I use a Capture Cam Clip to secure my main cam to my shoulder harness. The whole system is super comfortable and is the best compromise I found for serious hikes. I have the sling version. that I got because I wanted something larger than the Think Tank Turnstile which I love. The shoulder strap is not padded, or minimally padded and the Photocross feels really heavy after walking a bit. The strap digs in the shoulder. it looks fixed in the backpack. Also the main compartment has only one single zipper pull instead of 2 (maybe for water resistance) making it less convenient and less options in how to open / close the bag. I think this one also has one zipper pull. I wish Think Tank would make a larger version of the Turnstile and a backpack version too. The material of the Photocross shows more wear and tear than the Turnstile, as it tends to crease and crack. This is significantly different than the sling version - not sure why you are even discussing that production in relation to this backpack. I love the photocross, and disagree that it feels really heavy - I love the strap (could be padded just a bit more) - but it's wide and distributes the weight well. Chose it over the photocross as it's simply too small - not water bottle, straps for tripod, etc. I 100% agree with your assessment. I too have the Turnstyle and the sling Photocross; It just seems that they’are (Mindshift) are starting to lose their way. Woodygg I compare the products because they belong to the same line. I wonder if the backpack straps are not padded as well. I emailed TT/MS and their rationale is to not make the shoulder overheat. which makes little sense as the back s usually most affected by carrying a bag in hot weather. The Turnstyle with the same equipment feels lighter, it has a wider, more rigid strap. I bought the Photocross to carry a 13 inch laptop, a water bottle or a light stand, it has a top handle. But the advantages are not worth the extra weight, less durable material that creases and cracks , lack of documents bag. I wrote my thought to the company. I love the Turnstyle and it can fit my old Macbook Air 11 that i use for filing assignments in the field. I would love a Turnstyle for a 13" laptop, top handle on longest side, side pocket for bottle, tripod or small light stand. I tried a lot of bags and the Turnstyle is the one I use and like the most. To each their own. I own the Photocross 13 sling and love it as a "just big enough" bag for travel and light hikes. Some prefer two shoulder straps, so this might work for them. The bags are well designed, well made and fit my needs. The bag looks ok but no external pockets for small items and food like energy bar, the waist belt has no molle to attach a pouch, the bag is for urban more than use in the wild, there are other more practical backpack suitable for camera gears. agree on the external pockets - they're trying to compete with the latest hipster looking bags, which I find less than useful because of their lack of storage (external). I don't care about mole on the waist - all of my hip strap bags simply slide over the waist belt, which I prefer. You can have a bag that stores your gear securely or you can have a bag that allows easy access. Pick one. Ever looked at the rotation series? That offers protection and easy access. Is it just me, is the zippered access on the wrong side? Wouldn’t it make more sense to have the access point on the left side of th bag, so you could sling it around and have your right arm/hand free to grab the camera instead of having your right arm/hand be occupied with the shoulder strap? The PRVK bag has it right with the side access on the left side and other side access bags are similar. I personally prefer it to be on the right side, but that's just me. After all I hang a shoulder bag on the right side too. Mohammed didn't have to come to the mountain. He could carry it in this backpack. I don't normally carry a backpack in urban situations. But if I do, I fasten the zipper pulls together with inexpensive twistie cable key rings. They take two hands to open, and a little luck. The problem with these side-entry bags is that a valuable lens, body or flash can easily drop out while you're extracting another item. Bags that open at the front are OK but make life easy for pick-pockets. Safest way to carry gear is in a bag the opens at the back (i.e. with the opening facing your back). A bit slower to use, as you have to put the bag down to access the gear, but much better than having the gear drop out accidentally, IMO. Tenba Fulton 14L. Very new. No in-depth reviews I’ve seen besides a few comments on the B&H site. @kaipr Thanks for the suggestion. Hadn't seen that one. The lack of side access is a deal killer for me. When wandering around in developing countries and needing quick access to my gear, front or rear access doesn't work. I'm not going to set it on the ground in the middle of Old Delhi to change lenses. @xb70fan Hadn't seen that one either. As I said above, the lack of side access is a deal killer for me. I understand the security benefit of no side access but, for me, it affects usability. This is why I love the WANDRD PRVKE 21. It really gets everything right, IMO. And you're not providing easy access to your iPad or notebook like with the Fulton. I just wish there was a PRVKE 14 with a lower profile and no laptop compartment. Where do my outdoors sandwich, fruit piece, cereal bar and hydration pack fit in? Possibly in between the lens and the body? @tlinn. I cannot find any separate hydration pack space and its pipe hole in the Prvke. But that camera cube (is it included or as I suspect, separate?) looks interesting if it's half-insulated. Currently I use a LowePro sports and a regular mountain backpack that I have adapted with a camera and lens compartment. I wouldn't use this as a serious hiking bag; there doesn't seem to be a hydration slot. Though a half-day hike with a 1L bottle seems reasonable enough. @Txoni: I went down the same road - I simply use the decent hiking bags (from small to big) that I have, and insert as many padded camera +/- lens compartments as I require on the day (or multi-day trip). It saves money, AND it ensures your bag has its priorities straight: to make carrying it around comfortable. @Txoni I missed the hydration bag reference. You are correct. There is no accommodation for this. The WANDRD PRVKE is great as a daily carry or for travel. Spending a month wandering around India? The PRVKE 21 is perfect. But for long hikes in the wilderness there are better options. That's when I usually pull out my Fstop pack (though I really miss the side access of the PRVKE 21). Just my 2 cents... there are many bags with enough capacity for camera gears and food and stuffs, but the external pockets are usually hidden, for example when you put in a 32oz water bottle, half of the bottle will stick "into" the bag where your gears located, camera gears need well protection, so the internal compartment should maintain shape and size all the time. There are very few bags with large enough water bottle pouch that does not share space with the interior, that's the first thing I look into when choosing a bag, especially smaller bag. How is it not rugged enough for a day hike? It doesn't have a metal frame to make it sturdy and transfer weight to your hips, it lacks the necessary pockets/space for the gear (eg hydration pack, food, rain coat) you'd need on a day hike, it depends on a separate cover to make it waterproof (good luck quickly grabbing your gear like that). It looks like a nice camera-oriented bag, but I see no elements to call it more rugged than the average camera bag. Compare it to any decent hiking back and you'll see what I mean. I'm not sure wether a 20L backpack would benefit at all from an aluminum frame in addition to its thick frame which it has to protect the camera gear. The video also says it includes a rain cover and my other 2 mindshift backpacks included rain covers as well, great ones I have to say (large enough for including tripod, good to pack, easy to pull over and secure). I don't know the material, but their normal backpacks already use great sturdy material which I trust to handle slight rain, so I personally would assume that this is even better, so why not call it that. Of cource it's not marketed as waterproof because they don't lie in marketing and it's not made to submerge it in water for several minutes. Space wise, well, it's a 20L backpack, blaming it for not being 30L is...interesting. Which mindshift backpack did you have bad experience with that made you think this is not as advertised? @kaipr and woodyggg: the product video and the first line of the product description ("Adventure photographers need a camera bag that’s as tough as they are") clearly single out serious hiking as the main activity this backpack will facilitate. Well, for various reasons I and others have mentioned, this bag is NOT well suited for serious hiking in the terrain suggested. I am not saying Think Tank make poor bags, I am saying that this one is wrongly marketed. I went to the local camera store this past weekend and I was surprised to see this bag. It is actually really nice, it is well made (as all think tank bags) and it seems that the zippers seal perfectly the gear inside. Not for me as I already have more bags than I need but this one would be in my list if I was looking for one now. $170 bucks without tax for a bag that has poor back area air flow (no channels, questionable padding) and that doesn't even have zip pockets on the belt, ya know... the kind of pockets where you'd put essentials such a Bear Spray on one side and your backup compact cam on the other. I would hate to have pockets on the straps. We don't really have bears and I don't have a tiny backup camera that is not better stored otherwise. It would also make using the capture clip harder or impossible. Well, of course you COULD have read my post, which mentioned the lack of pockets on the BELT... lol. I'm glad it doesn't have built in pockets on the belt... those are never the size you want. I'd MUCH rather use the belt carriers I already own and simply slide them over the waist belts - you know, the one's that are actually big enough to hold bear spray. Well dammit, you guys actually did it! Definitely going to check this out!